We at Shine love books and believe it is never too early to encourage literacy development. As educators, we make sure to create classes rich with books, games, puzzles, and projects all of which promote a strong foundation in literacy skills. It is important, especially during the early years, that these ideas are encouraged in the home as well. This week Kristin Michaelson, M.Ed., president of Advantage Development, provides some very helpful ideas on how to make your home environment more supportive for literacy during your child’s first five years. After all, the greatest gift to give a child is the foundation for the love of reading and learning. Literacy is a process that begins with the simple experiences of hearing language from caregivers and the shared reading and handling of books. To encourage literacy development at home: talk to (and with) your child, create a print-rich environment, sing songs, and read books together. Read on for more specific activities, important milestones, and ideas on how to make your home environment supportive for literacy. Note: although activities are listed in a certain age group, they can be used indefinitely as long as they seem helpful to your child. What can my baby do? Babble, hold books, put books in her mouth, focus on books, sit up on her own. Activities: Make your home a print-rich environment. The first step is having a lot of books for your baby. Especially at this age, plush, wooden, or board books are almost indestructible and can withstand going in the mouth. Make labels, with both writing and a small picture of the contents, for boxes of toys and post their name in multiple places. Children should see their parents reading and using writing in their daily lives. What can my baby do? Help to turn pages, point to pictures, begin using writing and drawing implements, be more active in book selection (since they are getting around on their own), use a larger variety of sounds in babble, say first words, make babble sentences. Activities: Make a “literacy station” at home with lots of paper, drawing tools, books, and engaging toys. Begin letting your child experiment with markers, crayons, and paper. Let them see you having fun and using the materials as well. Longer books are now appropriate as your child’s attention span increases. Do not worry about finishing the book every time or reading the same page 10 times if your child wants! Make a book bin for your baby that stays next to his other toys. Pick changing themes for the books or just mix up a bunch of favorites. What can my toddler/2 year old do? Up to 200 words in vocabulary; early attempts at writing (scribbling); the beginnings of the symbolic play, which supports the development of language; simple shapes such as circles and lines. Activities: Expose your child to rhyming and letters. 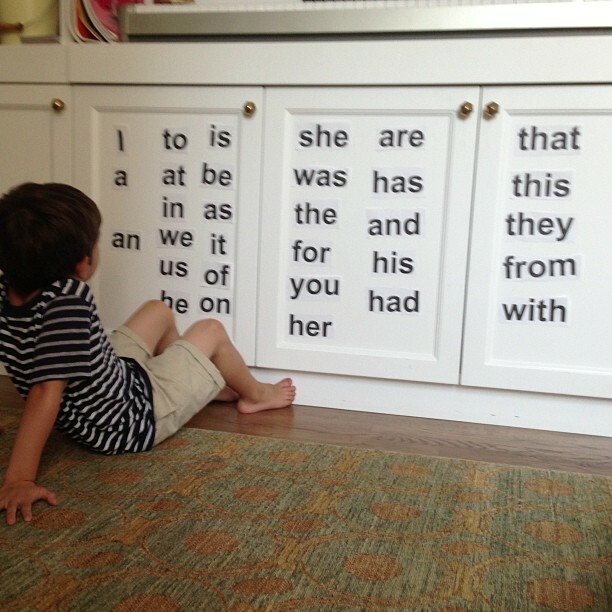 This can be done through nursery rhymes or rhyming books and songs, as well as letter blocks. Letter stickers are a fun way to incorporate literacy into art. Post the alphabet at eye-level somewhere at home. The best posters have corresponding pictures for every letter. Make everything fun! What can my preschooler do? Use more and increasingly complex sentences, enjoy rhyming games and songs, recognize letters, early associations of print with meaning, beginning letter writing, pretend reading. Activities: Provide lots of opportunities for make believe play, as this fosters the symbolic thought that is essential for language development. Bonus: do pretend activities that involve writing, such as taking orders in a restaurant or making signs for the freeway made out of blocks. Use this chalkboard computer to make writing even more fun. As children develop their ability to think symbolically, encourage them to learn the sounds that letters make. Give them a few words that start with the same sound and ask them to think of one too. Show them the letter and guide them in making the corresponding sound. As you’re walking around outside, you can even say: “Hey, I see a car! C-c-car. What else sounds like c-c-car?” If they need a little help, give them two choices: “Does c-c-cat or z-z-zebra sound like c-c-car?” It’s a fun game to encourage letter-sound correspondence while on the go. Bredekamp, S., & Copple, C. (Eds.). (2004). Developmentally Appropriate Practice in Early Childhood Programs. Washington, D.C.: National Association for the Education of Young Child (NAEYC). Kristin Michaelson is an early childhood education consultant who works with parents, schools, and companies on issues related to child development in the first five years. She also educates new parents through seminars and private consultations. Kristin earned an M.Ed. from Harvard University in Human Development and Psychology and a B.A. from the University of Pennsylvania in Psychology and Biological Basis of Behavior. Feel free to contact Kristin at kmichaelson@advantagedev.net.